This program provides preschoolers with 1 book a month from birth until age 5 at no cost to his or her family. The program is funded by businesses, corporate sponsors, service groups and individual donations to United Way of Southwest Louisiana. Educators emphasize that reading with a preschool child is the single most important activity to help prepare a child for success in school. For most families, books are a common part of a preschoolers regular routine. What happens when parents cannot afford books, take time off work to go to the library or do not have transportation to get to the library? Nationally, studies have shown that as many as 61% of low-income families do not have age-appropriate books for children in their home. It is estimated that as many as 2,788 preschool-age children from low-income families in Southwest Louisiana do not have access to books simply because their families cannot afford them. Children entering school without basic literacy skills often struggle academically throughout their education. This can put a strain on family, school and community resources throughout a child's education. My child gets so excited when he receives his book every month, and I get excited because it is helping prepare him for school. 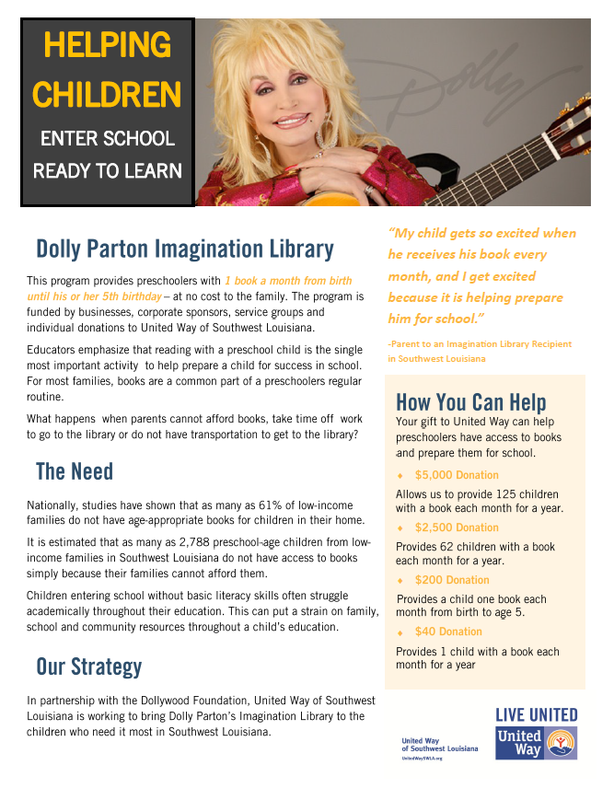 In partnership with the Dollywood Foundation, United Way of Southwest Louisiana is working to bring Dolly Parton's Imagination Library to the children who need it most in Southwest Louisiana. Your gift to United Way can help preschoolers have access to books and prepare them for school. Allows us to provide 125 children with a book each month for a year. Provides 62 children with a book each month for a year. Provides a child one book each month from birth to age 5. Provides 1 child with a book each month for a year. If you have a birth to 4-year-old child in Allen Parish, please download the Dolly Parton Imagination Library form and send it in. Your child will receive books until they turn 5 at no charge to you!